Hello Guest ! Welcome to my site and thank you..Visit again..
1.Heat a pan with 1 tsp oil and fry the thinly sliced small pieces of coconut and set aside. 2. Heat the same pan with 3 tbsp oil and add mustard seeds,when it crackle add ginger, crushed shallots, a pinch of turmeric powder and curry leaves. Saute it for 1 minute. 3. Add chopped lady finger and salt stir well for 2 minutes and close the pan with a lid and allow to cook in a low flame for 8 to 10 minutes. Stir it one or two times. 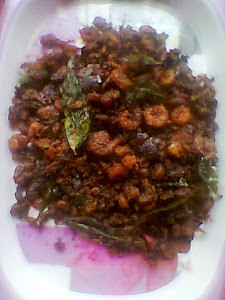 Now Lady finger meshukupurati Kerala style is ready. 4. Serve it with rice. * You can use onion instead of shallots. * Turmeric powder is optional. * You can use dry red chillies instead of green chillies.